"I had no idea that the gate I would step through..."
"Marie Howe's poetry doesn't fool around," said Margaret Atwood about Howe's first collection, The Good Thief, which received a National Poetry Series award in 1989. "These poems are intensely felt, sparely expressed, and difficult to forget; poems of obsession that transcend their own dark roots." Howe's second book, What the Living Do, in which "The Gate" appears, is largely an elegy to her brother John, who died of AIDS in 1989. In addition to the feelings of loss that many of her poems reveal, hope and an appreciation of life are also important themes. "Each of them seems a love poem to me," Howe has said of the poems in this volume. Among her many honors, Howe has been a fellow at the Bunting Institute at Radcliffe College in Cambridge, Massachusetts, and has received both NEA and Guggenheim fellowships. She currently teaches creative writing at Sarah Lawrence College, Columbia, and New York University. "The Gate" by Marie Howe from WHAT THE LIVING DO: Poems by Marie Howe, W.W. Norton & Company, Inc. New York, 1998. 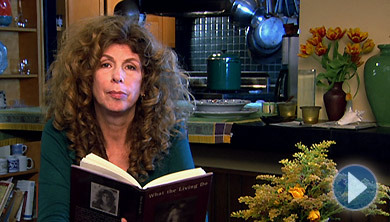 To read this and other poems by Marie Howe, as well as biographical information about the poet, please visit the Poetry Foundation Web site.